The Israel Boycott and and divestment campaigns are genocidal wolves masquerading in humanitarian sheep's clothing. Those who, in all innocence, fall for them, are supporting a campaign for ethnic cleansing of the Jews from Palestine, under the guise of a "One State" "solution." Such a state would not be a pluralistic paradise for two peoples. The intent of the one state solution, since it was conceived by advocates of the Palestinian Arab cause in the 1930s, was to destroy Zionism and ethnically cleanse Palestine of its Jewish population. In its final effect, this "one state" "solution" would be the same as the "one state solution" advocated by the Nazi Grand Mufti, Hajj Amin Al Husseini , a confidante of Eichmann and Hitler. Husseini, the main advocate of the "one state solution" in the 30s and 40s, told the British that his solution for the Jews of Palestine was the same as that adopted for the Jews of Europe, namely extermination. The current anti-Israel boycott campaigns attempt to revive the Arab League boycott of Israel which was enforced beginning after the Israeli War of independence until courageous US action put a stop to it in the 70s. Most Arab countries still ban Israeli products, but European and Japanese countries are no longer afraid to do business. with Israel. 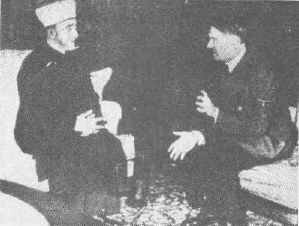 It would not be at all surprising if the originator of the Arab League boycott in 1948 was the Palestinian leader, Haj Amin El Husseini, Grand Mufti of Jerusalem, shown at left meeting with Adolf Hitler. After all, the Arab League war against the Jews of Palestine was his idea. Husseini had good teachers. 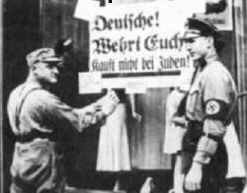 Beginning in 1933, the Nazis organized boycotts against Jewish owned stores, enforced by members of the SA. The sign reads "Deutsche! Wehrt Euch, Kauft Nicht bei Juden" "Germans Defend Yourselves - Do not buy from Jews." Ultimately, this campaign was to result in the massacre and ethnic cleansing of 6 million European Jews. At least one European commentator - not Jewish - sees a resemblance between the Nazi campaign and the current boycott. See European Comment on the Israel Boycott . Peace and Justice, but for Whom? Alongside the boycott by Arab states, which is illegal under US law, there are presently two major initiatives, begun since 2000 and advanced by various groups for academic boycotts and divestment. Divestment is an attempt to get large institutions to drop their investments in firms that do business with Israel, or firms whose products are supposedly used "in the occupation." In fact, any product that is sold to Israel for any purpose may be used anywhere, including the occupied territories. Therefore, the divestment campaign is an attempt to enforce a trade embargo against Israel. Thus far the Presbyterian Church of the USA has taken up this initiative and others are considering it. The second initiative is an academic boycott. This is particularly unfair since it would hurt Israeli academics whose work has nothing to do with the occupation, and scholars who have spoken out against the occupation. The Israeli security fence (wall, barrier) has become a major issue in these boycott campaigns. It is a good symbol. Walls are ugly and separate people, we are all against walls. This natural aversion has been enhanced by fanciful propaganda claims that the fence cuts off 50% of the Palestinian population or annexes 40% of the West Bank In fact, the fence includes 7% of the area of the West bank, none of which is annexed to Israel, and presently includes about 50,000 Palestinian Arabs. The protestors thinly disguise the fact that they are using the issue to delegitimize Israel, and that their goal is not peaceful coexistence of two people, but genocide. In the past, we used to assume that our struggle has two stages: the struggle against occupation and struggle for a just solution of the conflict and peace. We used to say that the end of occupation will not bring about an end of the conflict, but is a condition for the latter. We had short term and long term objectives, i.e. ending the occupation by means including armed struggle vs. the debate over one- or two state solutions. The idea was that the final settlement should take place in a peaceful context rather than within armed struggle. We must turn the one-state solution into a relevant political agenda, in Israel, the 1967 OPT, in the camps in Lebanon, among Palestinian exile communities in Detroit, everywhere. The task is to transform an intellectual discourse or exercise into a concrete platform. And we must know that all lines with Jewish society will be cut, when a call for sanctions/boycott is raised. But we must also remember that no power from within that can change the current reality, neither from within Jewish society, nor from within Palestinian society in the 1967 OPT. - The legitimacy of Israel’s regime must be challenged for its racism on the one hand, and its colonialist character on the other. The only way this regime can be brought to collapse is from outside. We have to call for boycott and sanctions against Israel. - There is no chance to change Israeli society from within, we are at a dead end and Israeli society is becoming increasingly fascist. - We are dealing with the dismantling of power, and the question is how to convince this power to voluntarily dismantle. I totally agree that something more drastic is needed. - The Zionist movement has also not resolved its problems. The wall is not going to solve their problem. The question is who can tolerate more suffering, and the answer is usually that Palestinians can take more. We all agree that we need a comprehensive struggle, and that we have not been very successful so far. Therefore more pressure should be put on the Israeli side. While other methods should not be excluded, we need international sanctions. - There is corporate responsibility related to sanctions, divestment, boycott. For example, Caterpillar and Intel (on Iraq al-Manshiyya.). Campaigns should also target the Zionist organization (‘National Institutions’), such as WZO, JA, JNF, which are major perpetrators and maintain discrimination inside Israel. Clearly, the rhetoric about "democracy" and humanitarianism" is an implementation of the strategy to meet the "specific circumstances of organizers and their constituency," or in other words, a lie to dupe supporters. We demand ...establishment of a sovereign independent Palestinian state with Jerusalem as its capital toward the establishment of a secular democratic state in historic Palestine. Real peace groups oppose divestment. Before you join a boycott to "end the occupation," better check which occupation they mean! The Palestinian Campaign for the Academic and Cultural Boycott of Israel masquerades as a human rights group. In fact, PACBI was founded by anti-peace Hamas oriented Bir-Zeit University faculty. In English, they preach humanitarianism. In Arabic, they tell people that Palestinians who engage in dialogue are traitors who take crumbs from America and Europe, and they warn that the "Seeds of Peace" youth dialog groups is "most dangerous." MORE: Divestment Initiatives Israel Academic Boycott European Comment on the Boycott Israel Boycott? This page is copyright © 2005 by the author and Zionism and Israel Information Center. Please link to us and tell your friends. Please translate this page into your local language, link to us, and allow us to use your translation and link to you. You may print out and copy these pages for non-profit educational use. Permission may be granted to use these materials on the Web for non-commercial purposes in advancing fair play for Israel and Zionism. Use of these materials without permission is a violation of intellectual property laws. Zionism - Definition and Brief History>- A balanced article that covers the definitions and history of Zionism as well as opposition to Zionism and criticisms by Arabs, Jewish anti-Zionists. Zionisme israelinformatie- Zionisme Israel/Jodendom Israelisch-Palestijns Conflict Anti-Semitisme Shoa - a Dutch Web site with many useful Jewish, Zionism and Israel links (in English too).